You are a proud crew member in the GnomeRepublic’s crowning naval achievement: the sleek and menacing nuclear powered submarine, Red November. With the latest advances in design and construction, precision propulsion, state-of-the-art technology, a deadly arsenal of modern weaponry, and previously unheard of sea-going amenities such as a grog-dispensing vending machine, your mission is to cruise the world’s waterways projecting the Motherland’s prowess, capabilities, and glory. This will be the highlight of your naval career. I mean, in such a sophisticated and highly-developed vessel, what could possibly go wrong? 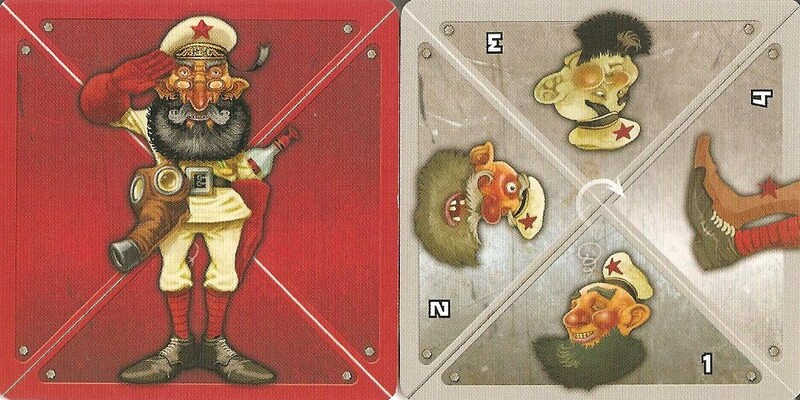 The object of Red November is for all gnomes to work together and survive for 60 minutes on the game’s time track. The problem is that the submarine seems to have been developed by the same people responsible for such other brilliant ideas like the Ford Edsel, New Coke, trickle-down economics, and Windows Vista. Or in other words, it is the worst piece of engineering since the automatic seatbelt. 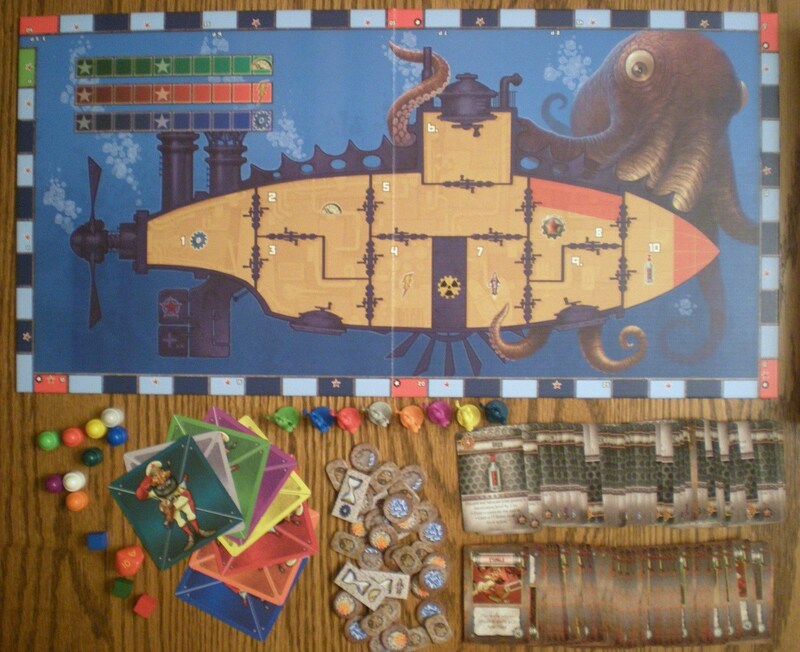 Players begin the game in a random room and with four basic items which will hopefully aid them in ship’s repairs and other matters. There are opportunities to collect more helpful objects during play. You’ll soon be praisingNeptune for these as just about every other minute some malfunction, or other near catastrophe, threatens to doom the fated vessel and its submariners. Components are decidedly on the small side – after all, they ARE for a submarine, I guess. 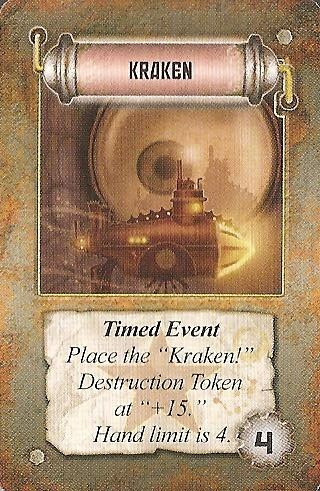 As players move about the boat, they will trigger random events at specific times from an event card deck. A few of the cards grant some minor reprieve, but most exist solely to make life difficult. In no particular order, you can explode, overheat, be crushed, asphyxiate, drown, burn, or be eaten by a Kraken. When things go wrong, you’ll frantically rush to address them by moving to the sections of the sub in which the crises flair. Of course, everything you do takes time. And as time passes, more problems arise. Responding to those new troubles takes more time, which means…well…you get the idea. To accomplish damage control, you must first move your gnome to the affected section (one minute per room, unless flooded) and then decide how many minutes, from one to ten, you’d like to gamble on trying to repair the problem. You then toss a d10 hoping to roll that number or less – otherwise you fail to fix it. You can always plan on the full ten minutes to guarantee success, but that just means a lot more bad things happen in the meantime. You’re also allowed to use one of your items which may give you a bonus to your repair time. Most of these tools are specific to certain issues. For example, the Deactivation Code gives you a +4 bonus when trying to shut down a missile malfunction. If your gnome is in the missile room and you gamble 4 minutes on trying to fix it, you’d have to roll an 8 or less. And to defeat the Kraken, you must at least possess an Aqualung in order to swim out to face the beast, hopefully toting along a Harpoon to turn the threat into some sushi. As each gnome advances his/her marker around the time track, he will have to draw new event cards at various points along the way. So while you take the time to successfully fix one problem, two or three more could potentially spring! But if the boat survives to the end, everyone wins – except, of course, any cowardly comrades who might have slipped out the back hatch with an aqualung, abandoning their mates to their supposed doom. Nuclear missle on a gnome sub. What’s next? A salon and spa on a dwarf cruiser? Does This Boat Sink of Swim? I always said, “The family that plays together, gets eaten by a giant, nasty Kraken together!” I unhesitatingly recommend Red November for its cooperative play and its crazy and silly theme, alone. 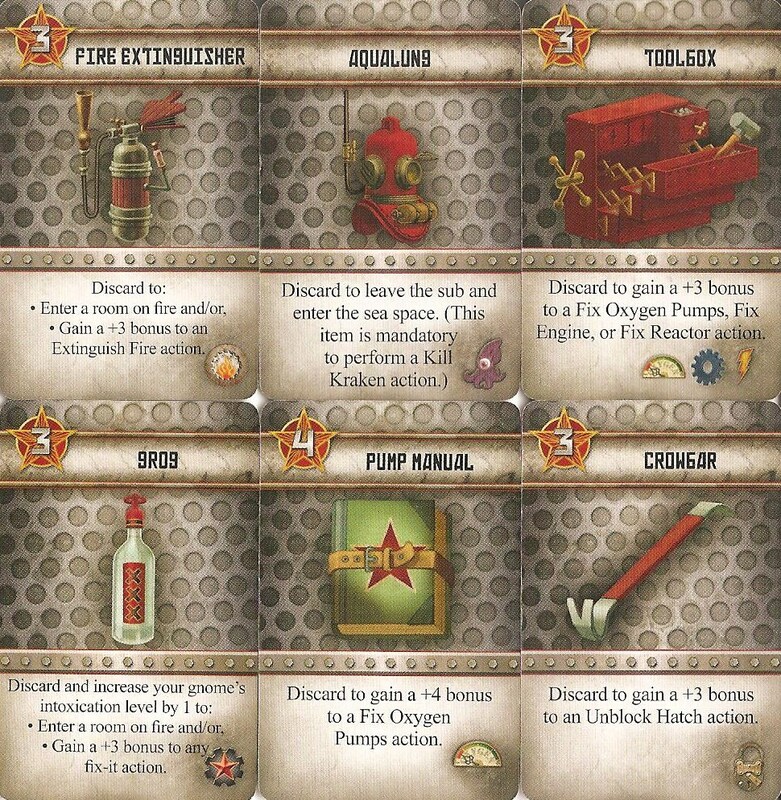 First, a look at the theme – it is one of the most unique I’ve ever heard of or read about in all of hobby gaming. Interestingly, from my understanding, Faidutti and Gontier were sensitive to the connection between their game and the real life Kursk disaster and so were careful to retain the submarine theme while not making light of that tragedy. That makes for a fascinating point of discussion on the topic of theme and content in hobby gaming. But one that would not be adequately dealt with in a review. 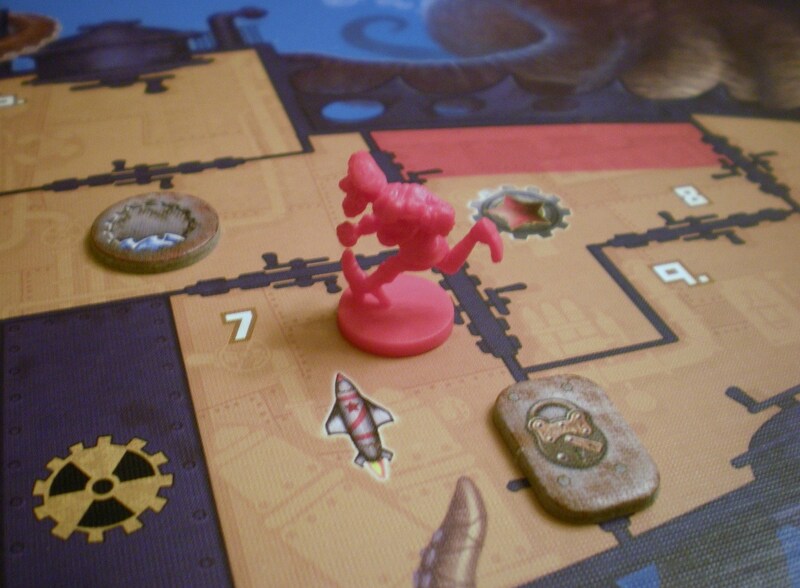 Nonetheless, theming the game with fantastical gnomes was part of that effort. 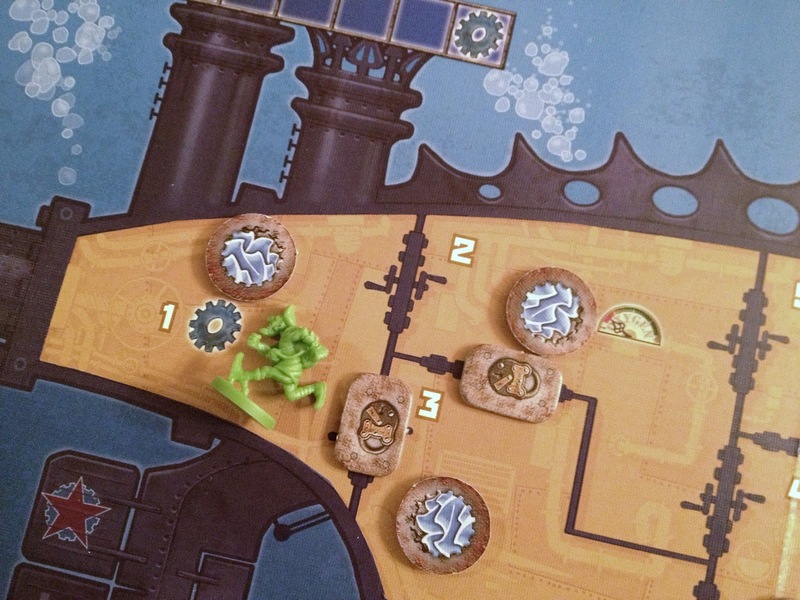 Adding the Kraken further solidifies this voyage as “over-the-top.” In any event, this title provides a refreshing game play that is very different from a lot of standard options. Lots of mostly helpful items – hopefully! Second, Red November has the whole cooperative thing going for it, making it ideal for casual occasions and family friendliness. Although admittedly the coop nature is less of an appeal to serious Euro players. As the adult and/or experienced gamer, the main thing I must remember is not to “take over” the game by telling, or even always suggesting, which moves and actions others should take on their turns. Allowing all players to share in analyzing needs and implementing solutions is part of the challenge and fun. Now that may sound like fancy corporate-speak (and especially silly considering the crazy surroundings), but this game is actually a good problem-solving exercise. You have to decide which player is best able to respond to which danger based on his/her location, inventory, and position on the time track – all relative to the other players. It’s very puzzle-like. While certainly basic, it is nonetheless a helpful skill to have in the real world. And I don’t think that is too pretentious a statement to make. There is no whining and grumbling and finger-pointing in this one. Just a lot of laughs while planning how best to save the stricken craft together – and maintaining your sanity in the process! Due to its puzzle-like nature, there are usually plenty of decisions to be made. You can temporarily yield certain parts of the sub to fire or flood, but if you let it get out of hand, things can spread to important rooms or restrict your movement about the ship. Players can trade items as along as their gnomes occupy the same room, but that takes up time. When fires, floods and blocked hatches plague critical rooms that need repairs, you can rush to the scene alone and take two turns to fix it all yourself; or you can tag team with a shipmate by pooling resources. All the while, you’ll try to keep an escape route open, just in case; if you’re trapped in a room that succumbs to fire or flood, it’s straight to Davy Jones’ locker with you! That game play also creates a great deal of tension. It is the definition of chaos – and quite random, to boot! Playing is the equivalent to sitting on the edge of your seat when watching a scary movie. In trying to risk the least amount of time to repair damage, you’ll all be transfixed on the die rolls to see if you succeed at each effort. And every time you’re required to draw an event card, you almost dread seeing what will go wrong next! Will it be a fresh problem relatively easy to address? Or one that compounds an existing issue? Will fires and floods continue to spread relentlessly, slowly chocking life out of the sub as the minutes tick away? And in those rare moments when nothing bad happens, you feel a collective sigh of relief! This tension keeps everyone involved in the game to the very end, even if your personal gnome perishes (yes, player elimination is possible). Downtime is irrelevant. Time passes quickly – both game-wise and play-wise! There are a couple of issues that throw a small wrench in the works – one thematic, one mechanic. The thematic wrinkle is a small one and probably not a huge deal to most people, but I’ll point it out just because of the game’s otherwise family friendliness: grog. Sure, it is certainly appropriate to the nautical motif, but I mention the presence of alcohol in case you are playing with kids, especially younger ones. Grog in the game gives you two benefits. It gives you “courage” to enter a compartment on fire – which you cannot otherwise do unless you have a fire extinguisher. I guess one can make a logical kind of argument there. In addition, it gives you a +3 bonus in fixing any problem, which is a little more difficult to explain regarding a substance that impairs judgment and motor functions! However the deleterious side effect is that each time you take a swig, your inebriation level rises which increases the chances that you might pass out. Not only do you lose precious time while lying in your own drool doing nothing of benefit, but if you’re unconscious in a room that catches fire or completely floods, you die. So in a twisted sort of way, there’s an object lesson there for your kids about the dangers of booze! The inebriation indicator. Drink your troubles away. The mechanic wrinkle is time track management. In short it is confusing and fiddly for most people who are not very familiar with the game. Your place on the track is marked with a corresponding colored marker. For every movement and action that takes time, you move a white “ghost” marker ahead the necessary number of minutes in front of you. Once your entire turn is complete, you move your marker forward one space at a time, drawing and resolving event cards at intermittent points along the track as indicated, until reaching the ghost marker. Then the next turn falls to the player furthest back in time, which could possibly be you again. 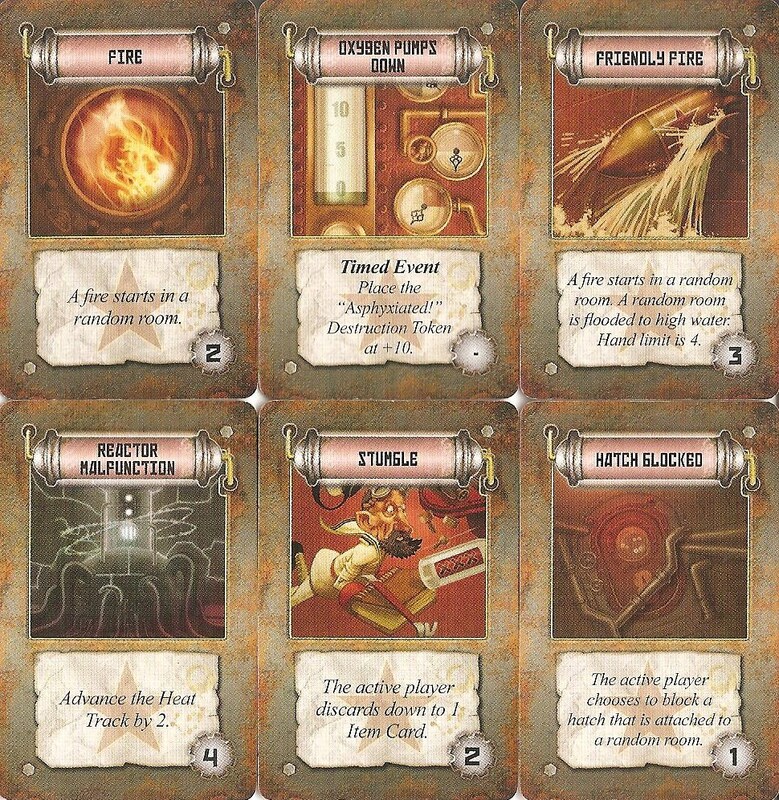 Then there is the added element of “timed destruction events.” If one of these cards show up, you place a token 10 minutes ahead of the point on the track at which it was drawn. If all gnomes pass this point before fixing the problem, the event destroys the ship and the game is immediately over. Understanding how it works and remembering to move and resolve everything in the correct order is awkward to learn and difficult for new gamers. Not that it could have been designed any differently, I suppose – it takes some getting used to. Yes, the experienced gamer can make sure the mechanics are properly adhered to, but kids and casual players often still get tripped up with how it affects their move, which creates confusion and mistakes in planning, which can lead to frustration. Unfortunately, the rulebook is not overly helpful, either, because it is poorly organized. Just a few of the nasty things than can go wrong. 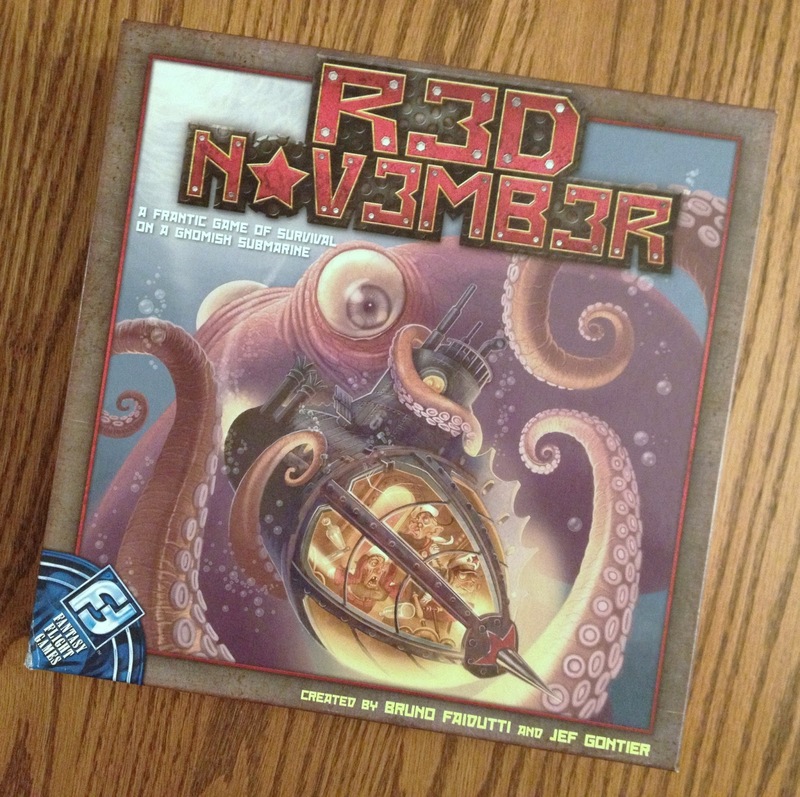 Red November’s cooperative element and the over-the-top theme combine to create a funny and engaging experience that is on a different level than standard, competitive games. While not a serious, strategic affair, its uniqueness should still provide a welcome, if infrequent, alternative to the usual, heavy Euros for seasoned hobby gamers. As long as they realize before setting sail on this boat that it can be silly and get out of control. However, that chaos and luck create a good, but lighthearted, tension that casual players, families and kids will be able to navigate and enjoy trying to manage.